A combination of work and recreation have me regularly traveling to Cambridge, and several times I’ve found myself passing Craigie on Main on my way to and from Toscanini’s for ice cream, and it’s grabbed my attention. It’s also been my hit list for a while since it’s a perennial entry on various Boston “Best Hamburger” lists, and it always looks like a rather inviting little bar/bistro for that neighborhood (despite the U-haul place and Tootsie Roll factory across the street). Well, I’ll be honest, I still haven’t had the burger, but it’s on my hit list. But last month we noticed that Craigie on Main also had a particularly interesting looking brunch menu, so when we had another free morning in the Boston area, we decided to head back over to Cambridge and try out their brunch. I’m rather glad we did. Our first observation at Craigie on Main is that it’s not just New Hampshire places that have odd liquor license issues. 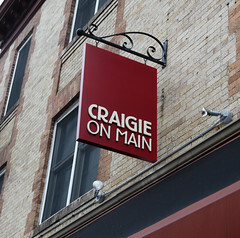 While Craigie on Main opens at 10:30, the waitress was most apologetic that, due to license rules, they weren’t able to serve any alcohol before 11am. Not too put off by this, we opted to head directly into the appetizers. I started off with a fairly simple item off of the menu: the buttermilk donut. 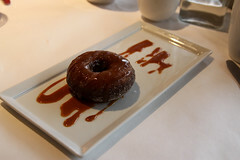 Unlike the elaborate five spice donut from Blue Ginger the night before, this was basic just a buttermilk donut. But it was definitely a well-executed buttermilk donut served up with confiture du lait, and ended up serving as a rather pleasant start to the meal. 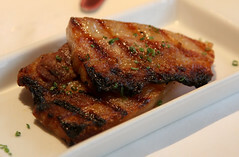 Carol, meanwhile, opted to try another simple item off of the appetizer menu: the pork belly. This literally was just that, two ample slices of pork belly, seared up nicely on the grill, and served up to us on a plate. Nothing more, and nothing less. Except that these were top-notch examples of good, flavorful pork belly. I’m not sure where they were getting their pork, but this definitely wasn’t Hormel pork belly, but a nicely seasoned and cured quality cut of meet (again, do I need to hunt down the person that told me that “bacon is bacon”? These things matter. And besides, how could a “professional bacon photographer” not order the “pork belly” on the menu? Next up, Carol’s entree: the house-Made spaghetti carbonara “Noir”. This was a solidly good carbonara, made with all the right techniques: fresh pasta, obviously finished in the sauce. A pleasantly light sauce with guanciale (pig cheek bacon, aka “face bacon” which is getting to be one of the trendy things these days) and boudin noir (French-style blood sausage). Top all of that with a perfectly poached egg, and this was a pleasant and unique dish, one I wouldn’t be ashamed to have as a dinner entree at a high-priced North End restaurant. Next up was my entree: the hash. This was the item that brought me to Craigie. 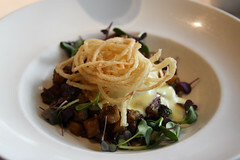 Quoting from the menu: “Grass-Fed & House-Brined Corned Beef Cheek & Smoked Beef Tongue Hash”. How could I not order this? And indeed, it was everything I was hoping for. The house-brined corned beef was nicely spiced, soft, and meat. The smoked beef tongue had a nice texture, and just enough smoke to add a nice dimension to the dish. Topped with nicely done onion rings and a perfect poached egg, this was a phenomenal brunch entree. Carol finished things out with a bloody mary (remember, they couldn’t serve those until 11). 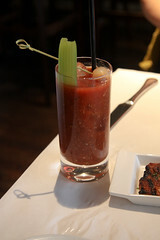 Made with house-made vegetable-infused gin and served with a pickled celery stalk, this was way better than your average bloody mary, and pretty close to being the best we’ve ever tried. I ended up being quite psyched after Craigie on Main, I’m eagerly looking for my next chance to try them out. The brunch menu has a few more gems on it (like the “Chicken-Fried Country Pork Terrine”), the burger appears (from looking at samples from the next table over) to be just as good as I’ve been led to believe, and the cocktails nicely done. They’ve got something going on here that warrants some of the hype. A little over a year ago, the small town of Fairlee, Vermont had a noticeable shift in the dining scene. The little restaurant right next to the town’s Whippi Dip creamee stand, which has been one of those restaurant locations that’s chronically failing (having at least 4 different restaurants in my years living here) had again re-opened, this time with rave reviews from most of the people I know living over Vermont. Furthermore, this time, the newcomer was definitely run by some good talent, the owners both came from the kitchen at Worthy Burger. So for a good chunk of the last year, Samurai Soul Food has been on my hit list, and a bit over a week ago I was finally able to work in a visit on my way home from Hill Farmstead.